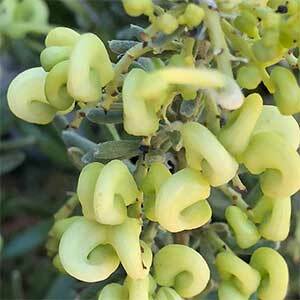 A low growing spreading shrub Grevillea lanigera lutea is not only long flowering it also has unusual yellow flowers. The flowers are typically spidery in form, they are however a very attractive and different colour. Like other Grevillea lanigera varieties this is an excellent plant for attracting birds, bees and butterflies to the garden. The flowers themselves form on long arching stems, this growth habit gives the plant an attractive spreading appearance. As this is a spreading rather then upright shrub, give it appropriate room to grow. Plant in a well drained soil. In poor soils, hill up the garden bed to improve drainage. A position in full sun to a little afternoon shade is best. Mulch lightly around the plant tp maintain a cool root run. An annual application of a specialist general purpose native plant fertiliser in spring can be used in poorer soils. A little light tip pruning after flowering will help maintain a more compact growth habit. Height – Low growing to around 1 metre. Flowers – Green buds opening to yellow. Foliage – Mid green, narrow and elongated.